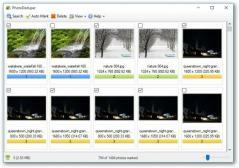 PhotoDeduper is a friendly application that makes it easy to find and delete duplicate images stored on your computer’s hard drive. You simply need to specify the folders that should be scanned and if any duplicates are detected they will be automatically sorted into groups. You can use one of the three viewing modes, and select which of the duplicates should be deleted. Furthermore, PhotoDeduper also has an Auto Mark option that can automatically select items based on a user-defined rule such as size, folder, creation date and resolution. The application lets you work with numerous image formats like PNG, JPEG, BMP, GIF, PSD and various RAW formats. It also offers the option to include hidden files in your searches, and exclude files that are too small.